Beautiful home on Highlake! Class A Fishing Lake! ***New****Just added washer/dryer and internet! Boat Landing is located one mile from this home. View is amazing, well-maintained home, and WiFi was a great addition. I had one question during our stay. The person answering the phone was very professional and courtesy. She did not know the answer but got back to me via phone and email. Top notch service. Wonderful stay. Cabin was clean and well equipped. Cabin was great. Appreciate the owner giving access to tools and boating supplies (anchors, boat bumpers, seat cushions, etc.). Makes the trip much more enjoyable when you do not have to run to town for a screwdriver or rope. The plentiful stock of box fans were a life saver as temps were in 90s. Only downside was not very conducive to swimming. We had a great week here on High Lake! What a beautiful view from the deck. 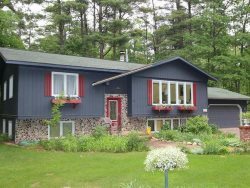 The home is situated in a great spot on the lake, very secluded. Even though the home supplies a canoe (it was missing the middle row seat which made it kind of wobbly) and a peddle boat, we arranged rental of kayaks through Northwoods Rental company and went out on the lake every morning - lake was like glass. There are a few islands in the middle of the lake where we saw loons and eagles. There is a really neat channel near the home which is so peaceful and full of wildlife. There is a public boat launch at the end of the channel but there wasn't alot of traffic coming from it so that was nice. There is a firepit and a swing on the property near the lake. The house was very clean. The only negatives I would share is the 'bunkhouse' over the garage has no bathroom and has pretty steep stairs and in the main house, there is only one shower so if you have a larger group that could be an issue. The main house can sleep 8 (there is a twin bed in the master bedroom along with a queen bed). The couch in the living room pulls out to a bed also. Rental group was very easy to work with, there is plenty of dishes and everything you would need to cook with. House is in a great location! Boulder Junction had it's "Musky Days" festival the weekend we were there, vintage car show and craft type vendors. There are a lot of bike trails near Boulder Junction and up near Land o Lakes. Eagle River and Minoqua is also not far away with a lot of things to do. We would definitely stay here again! We like it. Wish there was a second shower. Wifi would be helpful. 2018 we will have wifi! I worked with Julie, and she was great. Appreciate her answering all my questions and her patience. Your property was enjoyed by all. Thank you. Julie was very easy to work with. Prompt with returning messages. We had a wonderful stay. Hard to leave. House and bunk house were very clean. Lots of space. Great fishing. Loved the swing on the deck. We had a great time!!!! I loved it so much, I will return. Julie was professsional, helpful, and very nice. Tell us about your favorite feature of the property...Pier right on High Lake - just minutes from great fishing!What activities did you participate in while visiting? Fishing, walks, s'more in fire pit, shopping.